Devex Systems, a leading supplier of specialised heating and cooling solutions for homes and industries across Australia, chose Abel ERP because they wanted a system that could power their complex business functions. Abel had all the functions they wanted and had the flexibility to adapt to their particular needs. Everyone knows success is in the details. But for a business like Devex Systems that promises to “get it right every time,” taking care of the small things makes all the difference to its loyal customers and growing business. “Our customers are architects, builders, engineers and electrical contractors working on complex projects, and they need to rely on quality suppliers who offer the best products and deliver them on time,” says John Balass, Managing Director of Devex Systems. They don’t want any excuses or headaches. That’s why our focus is not only on providing superior comfort through high quality systems with market leading warranties, but also on offering service excellence. John says getting all this right starts with the right product range. 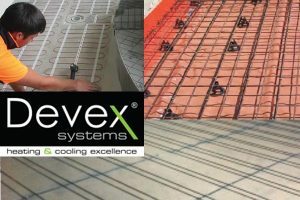 Devex Systems offers premium electric, gas or hydronic systems across three product categories: underfloor heating, overhead radiant heating and all-in-one sustainable energy solutions. Most of these brands are manufactured in Europe to meet Australian standards and are sold exclusively by Devex Systems. These high-efficiency heating and cooling products are used in residential, commercial and industrial buildings throughout Australia including a hospital in Tasmania, a Bunnings Warehouse in Victoria and the vast Barangaroo urban development project in downtown Sydney. For years the company ran multiple business systems in its Sydney, Melbourne and Hobart offices. But as the business grew their current system could no longer adequately meet their requirements and there was an urgency to make a change. “We were running different systems with a lot of duplication, timing issues and other limitations. We had to change but it was hard to find one system that could meet our distinct business requirements as an importer, distributor and contractor”. Devex Systems spent months considering several ERP systems before selecting Abel in 2015 to integrate and streamline its business processes. John says Abel’s functionality and flexibility are already delivering significant benefits across the business. One example of this is how Abel integrates data from the company’s proprietary design system to streamline the quoting and scheduling of jobs, which is particularly important for contracting work. Devex Systems engineers use their design system to build complex tenders and quotes, often involving separate solutions for different building spaces that use a few thousand components. This information is uploaded into Abel, which automatically creates a bill of materials with stock codes, pricing, labor requirements and scheduling details. John says even the little things make a big difference, such as an automated system for purchase orders and invoices. Instead of manually collecting invoices and passing them around the office in paper folders for signatures, they are scanned into Abel ERP and electronically distributed through the chain of approvals. John says Abel’s flexibility is making it easier for the company to keep its promise to “get it right every time” by also managing long-term warranties and product service. “Owners and builders move on so it’s essential to keep track of our products by their site address. Ten years on if a current building owner calls with a problem or question they probably don’t even know what product they have. But through their property address, we can identify everything about their heating system. John says Abel’s integration is very powerful as it provides a range of other benefits: improved financial reporting, inventory and customer management, as well as mobile functionality for the service fleet and a reduction in paperwork. After using the system for 18 months, he says Devex Systems is happy they chose Abel.